On November 7, there will be a groundbreaking of the President Carlos P. Garcia Pilipino Muna monument to be erected at the Carlos P. Garcia Avenue, formerly known as C5. The Governor of Bohol, Erico Aumentado, and the three members of the House of Representatives of the province, together with MMDA Chairman Bayani Fernando and Mayor Freddie Tinga of Taguig, will officiate the groundbreaking. The monument will be a tribute to the 8th president of our republic and an expression of gratitude for his noble contributions to our society, especially the Filipino-first policy. The event comes a few days after we commemorated the former president's birthday yesterday, November 4. 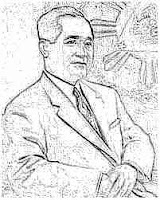 Garcia, the only Boholano president and the most accomplished Boholano stateman ever, was born on November 4, 1896. For all Boholanos in Metro Manila, you may join or watch groundbreaking at 2pm on November 7. If you want to know more about Pres. Carlos P. Garcia, don't fail to read my series of posts on him entitled "The Bard from Bohol".